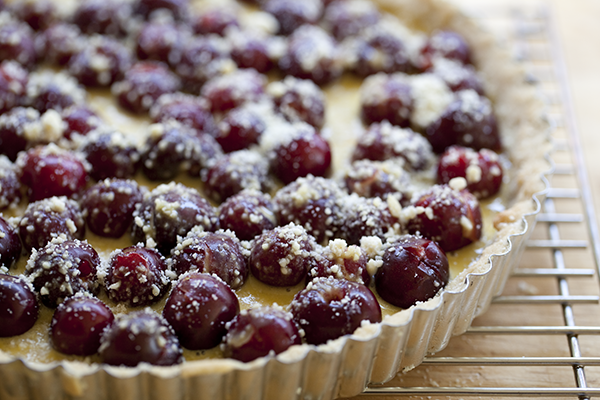 Soft cherries with kirsch and custard in a buttery almond cookie crust... can you resist? Patricia Wells is a cooking goddess. Every time I cook one of her recipes, I'm awed by the flawless result. 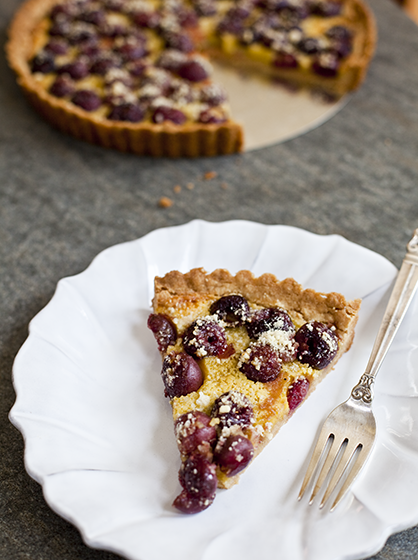 This cherry almond tart is no exception - it is so damned good! 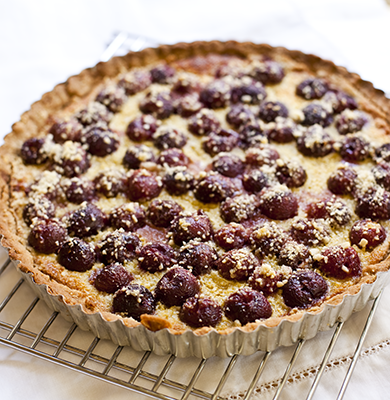 If you can get your hands on a pound of cherries, make this tart and you will not be disappointed. 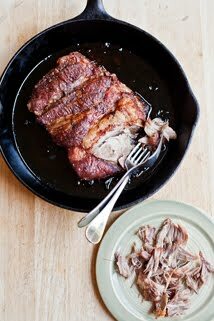 At first glance, the recipe may look laborious, but it isn't hard. 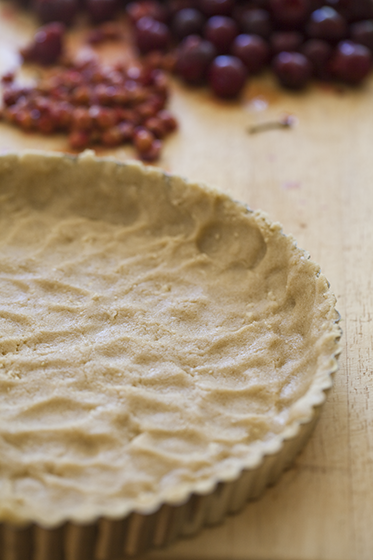 With the cookie crust, there is not need to chill and roll out dough - the most intimidating part of most tart recipes. I never get sick of cherries. Their season so is short and sweet that I enjoy it fully. I don't even feel guilty indulging when Monterey Market has organic cherries from Twin Girl Farms for less than three dollars a pound. I know it is gauche to talk $$, but this deal is too good to deny. We are eating at least a couple of pounds of cherries a week around here. 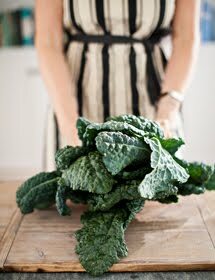 Usually they are devoured before one can imagine eating them any way but raw. Yesterday we bought an extra pound just to make Patricia Wells' Cherry Almond Tart. Butter sides and bottom of 9 inch fluted tart pan with removable sides. 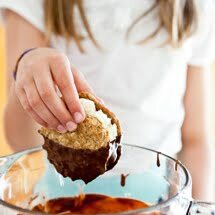 In a medium sized bowl, combine butter, sugar, salt, vanilla and almond extracts, and 2 tablespoons ground almonds. Stir with a wooden spoon to blend. Slowly add enough flour to make a smooth soft dough (the consistency of soft cookie dough). You may need less flour than the recipe calls for. Trust yourself. Bake in the center of the oven for about 10 minutes. The crust should be a very pale golden brown. Set aside to cool. Leave the oven on. Pit the cherries. I am not big into kitchen gadgets and didn't own a cherry/olive pitter for years. I finally bought one and it makes recipes like these possible. Go ahead get out your pitter or go buy one. It is a nice tool to have around. Combine cream, egg, almond and vanilla extracts in a small bowl and whisk to blend. Then add in sugar, flour, 2 tablespoons ground almonds, and Kirsch. Stir to blend. Sprinkle 2 tablespoons ground almonds over the bottom of the tart shell to help the crust from becoming soggy. 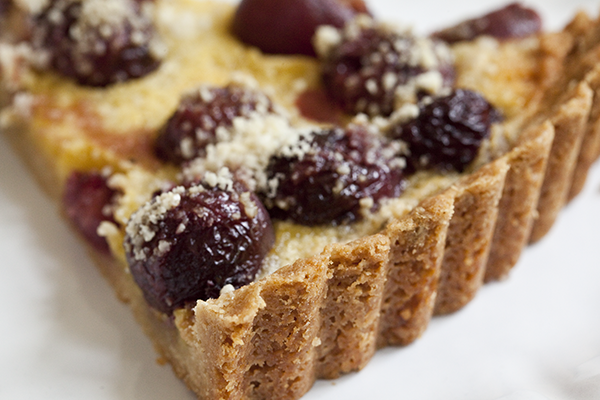 Arrange pitted cherries in the tart pan in a single layer. Pour filling around the cherries and sprinkle the top with the final 2 tablespoons of ground almonds. Bake assembled tart in the center of the oven for about 45 minutes. When done, the custard filling should be firm and the crust a nice deep golden brown. Cool on a rack. Wells suggests sprinkling powdered sugar over the top just before serving, but I found the tart to be perfect without. I can't imagine why this recipe isn't famous. This is one of the best desserts I have ever made. Thank you Patricia Wells! Meg, I think your amaretto idea is a really good one. I am such an almond fan - yum! This looks really good. I love the cherry/almond flavor combination. And thanks for the tip on the cheap cherries! This is the second recipe in the past two hrs I've seen call for kirsch. I might have to buy it now, since I have two awesome ways to use it. This tart looks so simple and beautiful. Pretty pictures, too. Hey Arugulove, isn't Monterey Market amazing? This time of year it is like the garden of Eden! Adrianna, I bought Kirsh just for this tart. Now I am looking for other recipes to use it. I keep thinking Black Forest Cake (one of my childhood favorites). 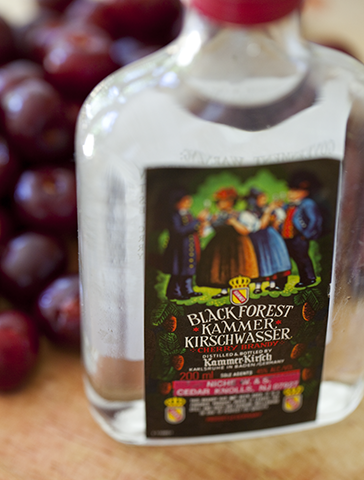 I'd love to know about the other Kirsch recipe you found. Poire au Chocolate, you would love this tart:) It really was incredible! That looks amazing! Now I have to get extra cherries. Like you, we seem to eat them all on the way home. this tart looks so, sooooo good...I made something similar last summer and still remember how amazing it was....although pitting cherries wasn't my favorite part of the process and it seemed like it was taking forever but....as you said, cherry season is short so I should make it again :) and I want to try this recipe! 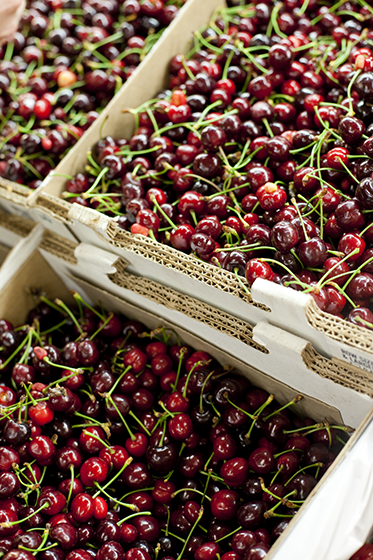 to add to the money conversation; last week I bought some Frog Hollow Farm cherries at the Ferry Building farmers market....I could not believe how TASTY they were..... but...$6.5 a pound!!!! ouch. 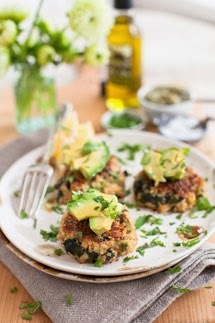 M., have you been to Monterey Market? If not, you should make a trip across the Bay sometime. 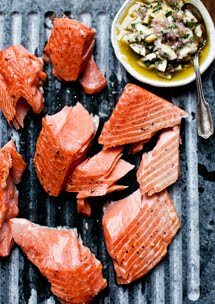 We Bay Area folks are spoiled by so much great produce (like Frog Hollow), but I see MM as being in a league of its own. The freshness and prices are ridiculous - not sure how they do it! This sounds amazing! Next week at farmers market I'm getting cherries! Can I resist? Absolutely NOT. I love cherry season, and I eat those lovely fruits right out of hand for as long as I can stand it. But, it's the desserts that really shine. 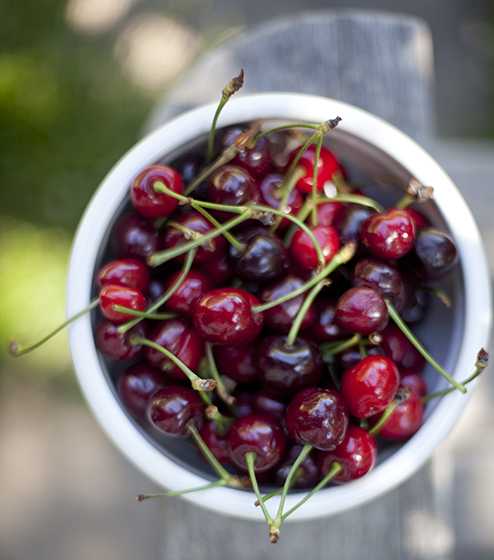 Can't wait for the Door County cherries to be in season... so fabulous. Your crust looks perfect! In France this is called a clafoutis. Usually they're made without a crust, but I think that part is essential! Jessica, thanks for stopping by. The crust really is an amazing addition to the traditional clafoutis. I get hungry just thinking about the flaky buttery almond flavor. I have been making this tart for years - I have the cookbook! :) - and found your site when I wanted a hyperlink to share with FB friends. Made this yesterday. Crust was lovely. I used less flour and was not sure whether the 8 tablespoons of butter is measured after the butter had melted. I ended up using 10 tablespoons. I didn't have enough dough for the sides so had to make another half a batch of dough. My 24 cm fluted pan might have been too big. I was trying to pit the cherries while the crust was baking and it took a long time for me to pit the cherries (my first time). used a cockscrew, fingers and finally a safety pin. It was a messy affair. What is the best way to do this without a cherry pitter? I used hazelnut meal instead of almond meal and it worked fine. Did not have kirsch but found a bottle of elderberry brandy. The alcohol content for the brandy was much lower than a kirsch so could not taste the brandy. In the end, the tart was delicious! Had it for dessert and breakfast! Thank you for the recipe. Hi there, glad you enjoyed the recipe and I like that you made it your own. - The butter should be measured before melting. 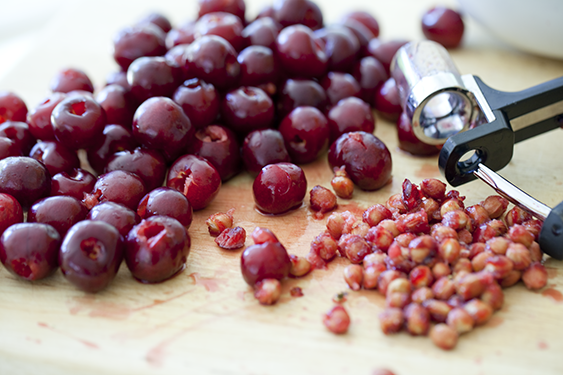 - I hate to tell you, but I don't know another speedy way to pit cherries - that's why I love my cherry pitter so much. It's worth it for this recipe alone. Made it, loved it. Ended up using slight less flour than mentioned, baked the base for about 15 minutes rather than 10 and left out powdered sugar on top. Easy enough recipe for a beginner like me. Thank you. Epic fail for me... Everything turned out well except the crust was glued to the bottom of the flute pan. I buttered and everything. The tart was neither overcooked nor undercooked..
Any suggestions? Maybe the crust recipe is too dry? Oh no Liza! I'm so so sorry to hear this. Sadly, I'm not sure what to tell you. It has been a few years since I made this recipe, but I have good friends who make it on a regular basis without any problems. One thought... have you every had any issues with your oven temp? I always keep an oven thermometer inside to ensure that the temp is accurate. Having the proper temp of course makes all the difference. This recipe looked fabulous, but alas, it is not yet cherry season here in the mid-west. Toyed with idea of using canned Oregon cherries, but decided, no. This recipe deserves fresh fruit. Our local market did have beautifully ripe pears and thought, pears and almonds are also a great "pairing" - sorry, could not resist. So, substituted quartered, peeled and cored ripe pears for the cherries, 1 tablespoon Williams Pear brandy for the Kirsch and sprinkled top with some Turbinado sugar along with the ground almonds. Kept everything else in the recipe the same. The result was dreamy! A truly luscious tart! 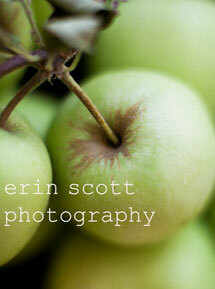 Can't wait to try again when cherries are in season, and maybe even blueberries? By the way, love your site! Photos are gorgeous and commentary sincere, entertaining and helpful. 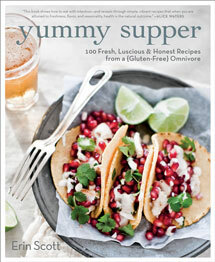 Also, recipes are indeed yummy. Many thanks! This is my first comment ever, sorry to be so long-winded. Oh my, I just made this and it turned out perfectly! What a great recipe. The crust was buttery and crunch, without being hard and the filling was to die for. Thank you for the recipe! I made this for Thanksgiving and everyone loved it! I used frozen cherries as there weren't fresh available and it turned out great.